Abstract: A significant number of urgent/out-of-hours CT brain requests are made for possible acute Subarachnoid Haemorrhage (SAH). CTs may also be requested to exclude imaging contraindications to LP such as signs of raised intracranial pressure, mass lesion etc. 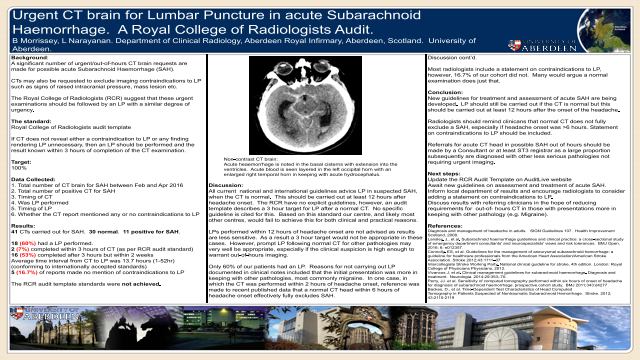 The Royal College of Radiologists (RCR) suggest that these urgent examinations should be followed by an lumbar puncture (LP) with a similar degree of urgency. Suggested target of performing LP within 3 hours of CT (if negative for visible SAH or other contraindication). Only 7% of patients with possible SAH and normal CT head had an LP within the suggested 3 hours. 40% of patients with normal CT head did not have an LP. 16.7% of CT reports made no mention of contraindications to LP. Most national and international guidelines suggest LP should not be carried out within the first 12 hours from headache onset. Suggested 3 hour target for LP may not be most appropriate and this should be updated on the RCR audit website. Recent data may suggest normal CT head within 6 hours of headache onset could effectively rule out SAH. Radiologists should remind referrers that normal CT head, at present, cannot exclude SAH and contraindications to LP should be documented. Summary: Audit of out-of-hours CT Head examinations for acute sub-arachnoid haemorrhage in a large tertiary referral centre. References: Diagnosis and management of headache in adults. SIGN Guidelines 107. Health Improvement Scotland, 2008. Lansley, J., et al. Subarachnoid haemorrhage guidelines and clinical practice: a cross-sectional study of emergency department consultants' and neurospecialists' views and risk tolerances. BMJ Open. 2016; 6: e012357. Intercollegiate Stroke Working Party. National clinical guideline for stroke, 4th edition. London: Royal College of Physicians Physicians, 2012. Vivancos J, et al. Clinical management guidelines for subarachnoid haemorrhage. Diagnosis and treatment. Neurologia. 2014;29:353–70.